The Sheridan Centre for Elder Research is pleased to share a student-driven research opportunity with you. She is interested in how we learn to use new technologies, specifically mobile touch screen technologies. She is looking for older adults 60+ who would be willing to discuss their opinions and experiences about the process of learning how to use new technologies. She will be conducting brief interviews and then working with participants to develop and test new learning approaches. If you are interested in taking part in this study please email Kaye Mao directly at maok@sheridancollege.ca to schedule an appointment. “Food for Life” brings fresh fruit, vegetables, dairy, meat and bread to those struggling to make ends meet. This program at 40 Ontario Street, helps our seniors who are living on a fixed income eat more nutritiously at no cost to them. We are looking for a group to help run this program on the noted Tuesday at the given time. To help run this program, there is no cost involved to you, we just need your time and energy. 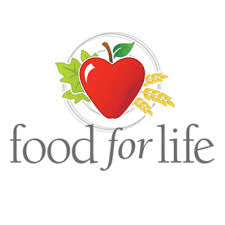 “Food for Life” would love to have you join the team, as we run over forty of these programs within Halton Region. To discuss this opportunity or just talk about “Food for Life”, please call Donna at 905-635-1106 x221 or email donna@foodforlife.ca. ​As seniors we are a very vulnerable demographic. Scammers and Fraudsters know this and take every opportunity to prey on this vulnerability. In addition they are coming up with new scams all the time. And as a result seniors are duped out of 100’s of millions of dollars every year. So….how can you be prepared? How can you protect yourself? What do you need to know? What do you need to be aware of? What are the latest schemes aimed at separating you from your money? Our Burlington meeting will be held on Tuesday January24th, 2017 at the Seniors Centre, 2285 New Street, Burlington. Our meetings at both locations will be held in the evening. Doors will open at 6.30pm with the main meeting taking place between 7.00pm and 9.00pm. Coffee and tea will be available. Both meetings will begin with a short welcoming address from our Chairperson, Tom Carrothers. Tom will also provide a brief update on your CARP Halton Chapter and CARP National activities. As usual we will have a number of sponsors for both meetings. We will be very pleased to welcome them we thank them for their support. They will have tables where you will be able to chat with their representatives and pick up additional information. ​Alert Best Nursing: offers a wide variety of services, including: in-home nursing care; attendant care for persons with injuries, disabilities or chronic illnesses; palliative care; and staffing solutions for hospitals, long-term care facilities and retirement homes. Heart to Home Meals: provides free delivery of delicious and nutritious frozen meals, soups and desserts directly into the homes of seniors. With 3 different meal sizes, 150+ menu items and specialty meals, seniors have many tempting selections to enjoy. Don Bassindale “Condo Don” Remax Aboutowne Realty Corp: Helping seniors find their ideal home. There will be a break at the midway point in the presentation which will allow time to socialize with fellow members and to visit our sponsors. Both meetings will conclude with a few closing remarks from Tom and our 50/50 draw. We encourage you to support this draw as proceeds help defray the costs of putting on our meetings. Our meetings are FREE. Please support your Chapter. We look forward to welcoming all members and their friends. Email kmackay@royallepage.ca or call (905) 599-9745. Designed for family caregivers who have been a caregiver for some time, this free five week discussion series addresses some of the more challenging aspects of dementia care, such as incontinence, home safety, long term care placement and making end of life decisions. This is not a beginner course, it is recommended that participants will have already taken introductory courses on dementia, such as our Dementia Information Series which will begin on March 7, 2017. Register online, space is limited to 20 participants. Halton Healthcare is seeking new and enthusiastic volunteers to join the ranks at each of its three community hospitals: Georgetown Hospital, Milton District Hospital and Oakville Trafalgar Memorial Hospital. Are you looking for an opportunity to make a difference in your community in 2017? Do you have an interest in helping others? Please apply to be a Halton Healthcare volunteer. Volunteer applications are now being accepted on-line, please click here. Paper applications will also be available if required. Volunteers truly help to create a patient and family-centered care environment and experience. Click here for more info on volunteering and application deadlines. 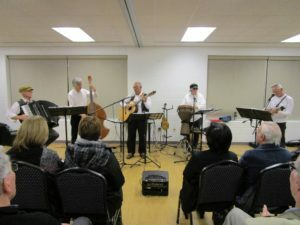 With their distinctive style and excellent repertoire of well known songs they soon had everyone clapping and singing along.